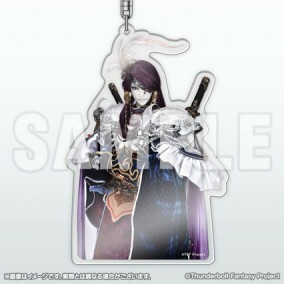 To celebrate the release of “Thunderbolt Fantasy: Sword of Life and Death”, Setsu Mu Syou, main character of the “Setsu Mu Syou chapter”, gets an acrylic key holder made with a photo of the glove puppet in his shape. It is the first acrylic key holder made with pictures from the glove puppets from “Thunderbolt Fantasy Project”. Quantities are limited. Sales will end once products are sold out. All images shown are for illustrative purposes only. Actual product may vary. Limited to a purchase of 3 units per person.